The waiting is over. Yesterday, the start of fiesta, I wrote that it was the day of days. I suppose then that makes today at least twice that. The first encierro, and San Fermin’s Feast Day. What a double act. We have to start, of course, with the first bull run. There is not too much I can say to those who have run a little before, and nothing I can say to the good runners, except…I admire the heck out of you. I don’t run anymore, bad back,…(oh, alright, pure fear)…but I used to and although I was never very good, I did have my moments and it is the one thing, along with some old friends, that I truly miss about the fiesta. Actually, if you can watch it first, (and not from the street, please…) either “live” or on television, please do. You might see a clean run and think it looks easy, or you might see something awful and decide, yikes, no thanks. But at least, if you’ve never seen it before, you will have now. It is the most extraordinary thing to do. All those dangerous sports out there at least have something controllable about them. Tragedies happen but you can do your best to check your gear, the weather, etc. With the bull run, you can personally do what you can to minimise the risks. But with even the extraordinary help of the professional herdsmen and the bravery of other runners…you are in the street with some wild and very dangerous animals. And pretty angry ones, too. And despite thinking you will be able to get out of trouble if it happens…sometimes you can’t. Trust me, I know. In 1995 a young American called Mathew Peter Tassio came to Pamplona one night. He ran the next morning. He got hit 43 seconds after the encierro began, and was basically dead within a minute of being gored. The doctors and nurses managed to keep him alive until 8.50 a.m, but he’d lost 90% of his blood by the time they got him to hospital. It took the ambulance 5 minutes to get there – that is very, very quick. As the Red Cross spokesman said at the time: “No-one survives the tearing of the aorta.” Not of the type that happened to Tassio. He was just 22 years old. The BBC described his injuries thus: “The fighting bull which gored him weighed half a ton. It hit him in the abdomen, severed a main artery, sliced through his kidney, and punctured his liver, before tossing him 7 meters, (23 feet) in the air.” Actually, it was 7 meters in the air along and parallel to the road. It carried him on its horn, causing irreparable damage to his insides as he was literally hung out to die. I’ll say it again: he was only 22 years old. 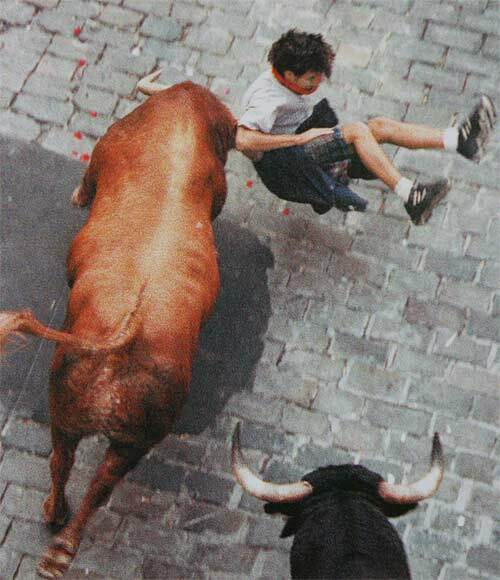 Staggeringly, after the bull left him the adrenaline made him get up and run to the fence, where he collapsed. The marvellous Red Cross were there, as they are all along the route. But it was too late. And this all happened after being hit and gored from behind. His big mistake? Yup, you’ve got it, he fell over and got up, and half a ton of a speeding bull ended his life. The poor lad didn’t know what he was doing. But even if you do know what you’re doing…In 2009 Daniel Jimeno Romero, a young but experienced runner, was gored in the throat. About 6 seconds later he was dead. Officially he died at 8.45, but…He knew what he was doing but got caught up in events he couldn’t control. He was 27. So, if you decide to run and there appears to be someone or a group who look like they may have run before, try going up to them and introduce yourself, and ask them about it. Most will gladly talk to you. I know many, many runners and they are all top, top people. Two great things might come from it also. It might just save your life, and you might end up making some new friends forever for that life. For life is a wonderful thing to be treasured, and nowhere more so than in this magical town during its phenomenal fiesta. So please, treat the encierro with respect. There have been 15 recorded deaths since they started taking note of these things…don’t be the 16th. But hey, have fun, stay safe, and good luck. And whether you believe in these things or not, try saying before you run, por favor, San Fermin, look after me. He may not speak English but I’m sure he’ll understand. Oh, and after the run, don’t forget to thank him, too. He must be a very busy man on mornings like this, but you just never know… So on his special day, Viva San Fermin! Gora! Just who was this chap? Well, he did exist and he was from Pamplona, back in the time when Pamplona was still part of the Roman Empire, around the 3rd Century AD. A French Bishop called Saturnino came to Pamplona to convert the local heathens – as you’ve no doubt seen, he seems to have failed! – and Fermin, the son of a local bigwig, was so impressed he went to Toulouse to become a bishop. Then he returned to his home and spread the word amongst his folk, before returning to France and Amiens, where things sadly went wrong for him, and he was beheaded. That’s one version. It’s said he may also have been the son of a Roman of senatorial rank, but it was a long time ago now…Anyway, he could also have been converted by Honestus, who was a disciple of Saturnino, and there are versions that say he wasn’t beheaded but dragged through the streets by bulls, which is sort of fitting but we’ll never really know. Whatever the truth, Fermin did exist, and all three people mentioned above were beautified. 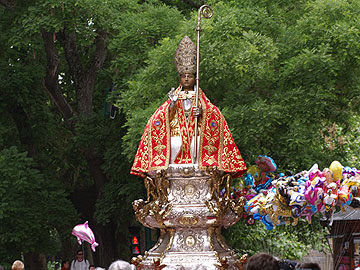 Saturnino is also known as San Cernin, which I used to think was a misspelling of Fermin. There is a church named after him in Pamplona near the town hall, called La Iglesia de San Saturnino. In the main tower sits the clock, dating from 1499, that announces the time for the launching of the rocket that starts the encierro. Also on the very top of the tower sits a weathervane, but I’ll come back to that in a couple of days. San Fermin didn’t start to become part of the town’s very fibre until around the 12th Century, when the first relic apparently reached it, and goodness knows what he’d make of the fiesta named in his honour. I’d like to think he’d have rolled with the times and be pretty cool with things and rather enjoy it. If you happen to see his figure being carried in The Procession, which happens today, why not have a look at him just to say hello. I’m sure when there’s been something funny going on or some great music is playing and people are dancing, I’ve seen him smile. After all, it’s his party we’re at. Gracias, San Fermin. July 7th is another difficult day to escape, and again, why would you want to? The first few days of fiesta are fantastic. But if you fancy a rest without leaving the old town, have a look for the Caballo Blanco or the Media Luna. Fiesta is still in full swing but they are both lovely places to hang out and have a drink and perhaps rest some weary bull running or dancing feet. Or there’s the Ciudadela…just ask. Tomorrow, by the way, we shall finally head out of town for our escape. But only just! It’s said that San Fermin has helped save people on the bull run. One may laugh, but it is surprising to many of us that more people aren’t injured or killed. Yes, the pastores (shepherds), and other runners help many people, and the Red Cross do some amazing work, but still…there have been many, many lucky escapes and I’ve had a couple too. So maybe, just maybe, it’s that “capotico” (cape) of San Fermin’s that he covers people with when they are in trouble. But remember, he can’t be everywhere, so good luck…one more time, gracias, and viva!